`Tis the season to be jolly! How about some Pichi-Pichi? Don't forget to top it with cheese, make that lots of cheese! 1. 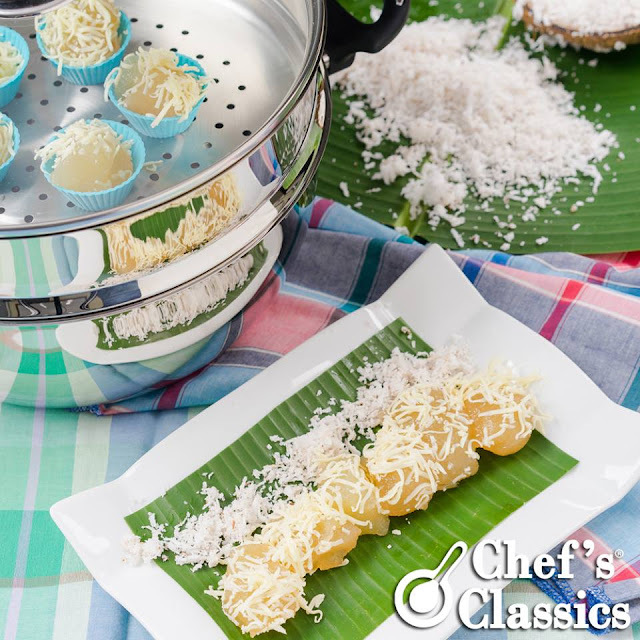 For the grated cassava, peel off the skin of the cassava and then wash with running water and finely grate cassava using a Chef's Classics stainless grater. 2. Using a clean cloth or cheesecloth, squeeze out all the cassava juices. 3. In a mixing bowl, combine cassava, water and sugar. Mix until well incorporated. 4. Pour cassava in molds. 5. Bring to boil a Chef's Classics Steamer and steam cassava mixture around 30 minutes or the cassava looks transparent like a gelatin. 6. Let it cool, transfer in a serving plate, top with grated cheese and coconut and enjoy!